Chances are that you or someone you know will be among 2.7 million AT&T Mobility customers who will be getting a refund soon. The FTC is returning a total of $88 million to people who were billed for premium text message services they didn’t authorize. But even if the settlement doesn’t directly benefit you as a consumer, it offers insights for business people about the steps the FTC takes to get refunds back to consumers – and the seriousness with which we approach that stewardship role. The FTC settlement was part of a joint action with the FCC and Attorneys General from all 50 states and the District of Columbia to crack down on mobile cramming. The FTC alleged that third parties placed unauthorized charges for trivia, horoscopes, celebrity tidbits, etc., on the phone bills of AT&T customers with AT&T pocketing a sizeable chunk of the take – 35% or more. A portion of the $105 million was paid in the form of penalties to the states and the FCC. The remaining funds – initially, $80 million – were earmarked for a consumer refund program administered by the FTC. But a program of that size isn’t just a matter of cutting a quick check. There are required procedures to make sure the money is returned to eligible consumers. Next, the refund administrator went over every single claim to make sure it was valid. The process was painstaking, but it was essential for maintaining the integrity of the refund program. Then came the complicated calculation of how the funds should be distributed. Some good news was that the FTC was able to add more money to the initial $80 million amount through assets recovered in related law enforcement actions against Tatto and Acquinity, third parties that added charges to consumers’ AT&T bills. In addition, the court required that an independent auditor review each step of the process – another important double-check to make sure the i’s are dotted and the t’s crossed. Once the auditor approved the final plan, the refund administrator prepared and printed checks and letters. Questions? 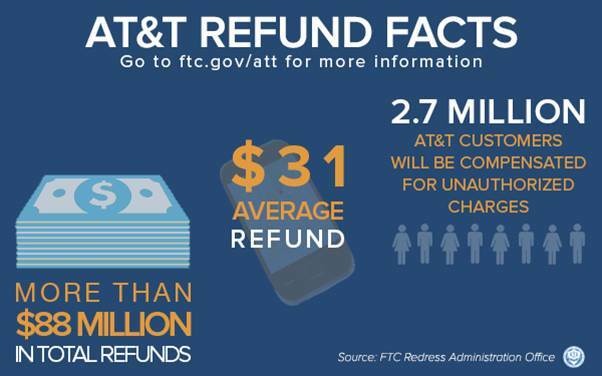 Call the refund administrator at 1-877-819-9692 or visit ftc.gov/att. $31? really? That's ridiculous! Must be more, almost $8,000 MINIMAL and by these means; officially I am requesting a report in details, of the money paid by ATT to you versus the numbers of customers, that will be refunded, due this fraud of ATT, and the detailed breakdown of quantities of millions paid by ATT. Also, I want to know the interest earned by you, while drawing the calculations in the last two years. Wow!! a got a check for $1.54 today..... Now where can I invest it? Am I one of the people to receive a refund? Am I one of the AT&T customers to receive a refund? I have been a customer for over 5 yrs' ? I believe that I have been overcharged on many occasions looking back on my phone bills. Only $31 dollars? Have been with AT&T since the 80s when they were called Cellular One. How many Months/Years has this $9.99/month bogus charge involve and why only $31 dollar refund? $31 is such a slap in our faces. I too have only been a Cingular, Bell South, Att customer from the beginning of cell phones. Never had but (1) cell number all my time. I'm sure I'm owed thousands! With all the wrong doing by these cell companies they still prosper! Names on sports arena's, sponsoring bowl games, never shutting down one of their businesses. The only hurt is in the consumers wallet/purse. It's all a huge scam regardless who cuts these checks. Sir my bill with att was 2330.00 and they recives all the the house phone and my hot spot.please call me at [personal information deleted]. What kind of fool refund administrator ask the fox for records guarding the hen house? Now they want approval to guard even more hen houses with the merger. Same old ATT that was busted up, and sadly no government watch dog. Regardless of how you voted you have to grant this is rediculus. I was with AT &T for over 10 years with 5 lines. I stopped with them after a bogus charge in 2013. I had proof from them that I did not owe, then they sent it to collection co. I sent proof/copies of AT&T Bill with $0 balance to collection co. And They dismissed and wouldn't touch it. I always questioned these "charges" but could never get a clear answer. How do I get in on this claim? I am SURE..they owe me something. I have gotten emails and mail that had me fill out the paper work. I did that. Yesterday I got a letter telling me I have already received,my refund. I have not seen it. I called the number on the letter and the told me to call customer service,for AT&T. did that and they find no record of it in my files. I have checked in the past were we were at on the web site given, and talked to to someone about it. They told me my name was on the list. I am totaly confused do or do I not get a refund? If not why did I have to fill out all the paper work? $31.00's!!!! Are you kidding me!! Seriously Trade Commission & Federal Communication Commission!!! They get billions from illegally billing us and that's what we get back?? Another sad excuse of how our system really protects the consumer. Slap in the face for us by allowing AT&T to NOT reimburse the amount they stole. Is there even a customer of theirs that possibly was just owed a refund of $31.00's??? Very disappointing and disheartening. what about business telephone bills? I have to fight with them every month. Every month they overcharge me and/or add some crap to my bill that I have never even heard of. Sometimes it takes hours to get everything in shape to pay my correct bill, sometimes they tell me that I have to call another number to cancel something that I've never heard of, then it all starts over next month! I know I'm not the only one! They probably steal enough in one month to pay all these settlements with. They tell me I'm under a contract with them, even though I've never signed anything. They tell me that the contract gives me discounts, but they keep charging me way more than the contract (the contract that I have never seen)is supposed to charge me. Can nothing be done to stop these con games from AT&T? This settlement only speeded them up on their illegal schemes. Does anybody care anymore? Are we all at their mercy? Why should my refund be added back to my phone bill, not my fault there were Charges on my phone. Seems like to me I'm not getting A Refund. Not Right at All!! I had AT&T for only about a year and got screwed from day one, we had three phones with our service and our bill was not supposed to be any higher then $150.00 that's a laugh more like $260.00 to $420.00 a month and the service kept getting interrupted and kept getting additional fees every time we made a complaint. I even called the main number and didn't realize i was talking to the CEO of the company he helped out for one month my bill was only $160.00 and was told that's what it should be from that point big laugh. So $31 is a joke for anyone regardless of time and service. Just saying !!!!!! I wonder if we can form a class action lawsuit or some other kind of lawsuit. Now that there is established evidence of false business practices. I wonder if we can after them for personal damages. A class action lawsuit is what I was thinking too! If a thief tried to rob a bank and got caught...they would be prosecuted and probably go to jail. AT&T blatantly lies, scams, and rob their customers, and gets slapped with a $105 million penalty. Yet, the 2.7 million AT&T customers only got $88 million to split...which equates to about $32 per customer...WHAT A JOKE! AT&T ex-customers getting screwed again!! After all this time 31 dollars????? VERY VERY SAD, Just another act of CRIME to our people, And AT&T, now has partners in crime, I can only hope everyone involved in this bigger scam WITH AT&T has to answer to SOMEONE? I was lied to when my husband was alive and told that my internet was a certain price 19.95 then the ole bait and switch happened so what about that? I received a letter from the FTC stating my refund was 'denied' because AT&T had already refunded my money. I called the FTC told them no refund was ever received and they told me they were unable to verify the refunds sent out by AT&T to customers, I was also told by two of their supervisors that the FTC represented AT&T not the consumer - Albeit, The Federal Regulation says different. It seems we have additional fraud to overcome. I will move forward with this as long as it takes,. . . . Perhaps the Justice Dept. can provide more answers. THIS IS WRONG! NOW SOMEONE NEEDS TO OVERSEE THE FTC BECAUSE APPARENTLY YOU ARE NOT LOOKING OUT FOR THE CONSUMER!! THIS TOOK YEARS AND OF ALL THE PEOPLE YOU SETTLE FOR A MEASLY 31.00 ? I HAVE PROOF THAT ATT PERSONALLY OWES ME 2300.00! I HAVE BEEN A CUSTOMER FOR YEARS! MAYBE OUR NEW PRESIDENT NEEDS TO BE IN ON THIS ! SO TIRED OF PEOPLE GETTING THE SHORT END OF THE STICK! RIP OFFS! I've been a customer of AT&T for about eighteen years now and I'm just finding out about this settlement. No one ever contacted me. Still waiting for a refund check. It's been about a year and a half sense I sent the papers in. Let me know what's going on. My records from 2009 through 2014 alone indicates cramming on AT&T's part with a double $9.99 charge. Mathematically it does not add up to $31.00. I received a $15.00 refund on my latest bill for February. By the way it took one year and 11 months to receive this .AT&T is full of excuses and their personnel don't have a clue as to what to tell a customer. I have called AT&T 7 times over the past year and a half only to receive different answers, ranging from the checks in the mail; the check will be sent next month; call back if you don't receive the check in 2 weeks; you will receive a credit on you bill in 75 days. Which do I believe? The way I see it AT&T owes in excess of $1,000.00 for bogus charges for 6 or more years. Am I one who is getting a refund? I have been with AT&T for over 16 years. I only received $17.82...I have been a customer since about 1995! I think I am owed more. I also received a letter from the refund administrator stating refund has been denied because AT&T indicates refund has already been received. I called AT&T and they stated a refund has not been applied to my account. Called FTC back and there is nothing they can do since AT&T indicates refund. Called AT&T back and received conflicting information. 1) refund was applied to account between 2009/2014 for this incidence but couldn't tell me the amount or specific date (can only see acts back to 2015!) How convenient! 2) refund was in amount of $19.99 but can't provide date refund was applied to account or if check was sent! How can I receive a refund in 2009/2014 when refunds weren't submitted until December 2016. If AT&T can tell me the amount of refund why can't they tell me the date? I agree with the others that this is another form of fraud and AT&T has no intention of paying these refunds. $31 is a joke. I've been a customer since 1977 but it's time to dump these crooks and go to another carrier. just got my refund check for $22.44 I expected more at least in the hundreds since I was with Cingular/AT&T for over 10 years. I finally had to switch to a new carrier last year because of the ridiculous amount I was paying monthly. I do not want to cash the check because I believe AT&T should compensate me for more. How do I contest the amount received? I deposited my measly $9.99 today. I'm glad I've since switched carriers. They're nothing but frauds. I received a check for $36.08, deposited in my checking account, and today received a notice from the bank that the amount was removed from my account and I was charged $10 by the bank. There is no explanation except stamped on a copy of the check is "Return Reason: Refer to Maker". We switched from AT&T to another carrier late last year. Not sure why the check was returned. Hi, Ronda H. I'm sorry you experienced that problem. If you call the Refund Administrator in this case -- the toll-free number is 1-877-819-9692 -- they may be able to be of assistance. Wow! 40 dollar check and I was charged close to 100 . Where is the rest??? FTC ?? Who has the rest of my money? No record of my Business account with FTC and no refund from ATT! How will they hold ATT Accountable????? 1st have no refund and not why is my bill showing not $40 for visual email can't change it says page no long available to change or view plan? Can I check on line for my refund amount? I have my e-claim number. I RECEIVED TWO DIFFERENT CHECKS BOTH LESS THAN $31.00 from Attm settlement. Are these safe to cash? All the wireless providers are thieves just who get got . I knew nothing about it and have 2 tablets and 6 phones and have had service with them since they started out as cingular . I get nothing back because i knew nothing of it. I have seen that from others so wrong. I have several accounts/phone numbers. Received several checks. Is there anyway of knowing which check represent which number? How do I check on the status of my claim? I have the confirmation number, but I can't find any place to check the status.